Holidays are the perfect time to offer a discount. Your fans are looking for easy gifts to give loved ones, or are ready to treat themselves. On Vimeo OTT, we see a sales boost on Valentines Day (+65%), 4th of July (+46%), Cyber Monday (+152%), Christmas Eve (+112%), and Christmas Day (+244% — digital goods can save the day for all those forgetful shoppers). Not all holidays are equal, as New Years Day (-51%), Memorial Day (-42%), and Labor Day (-40%) all perform significantly worse than average. 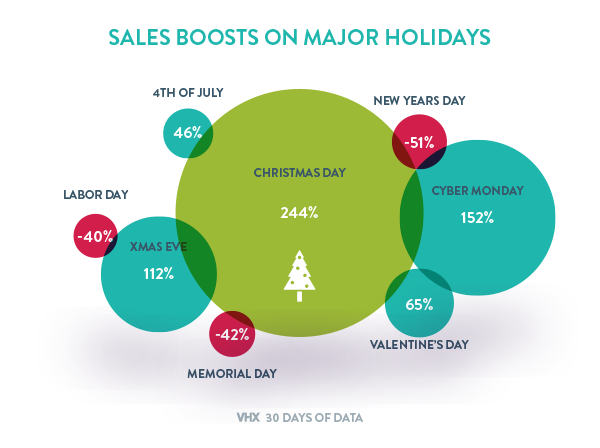 So be smart about promoting around the holidays that coincide with better sales!